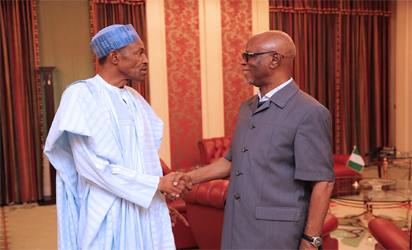 Buhari Sympathises With Oyegun Over Atiku’s Resignation. PRESIDENT Muhammadu Buhari yesterday jokingly sympathised with the Chairman of the ruling All Progressives Congress, APC, over the resignation of the former Vice President, Atiku Abubakar from the party. President Buhari in an unusual disposition while inaugurating a 30-member panel on National Minimum Wage, told Oyegun, “accept my sympathy for losing a senior member of your party,” in an apparent reference to former Vice President Atiku Abubakar who last week announced his decision to resign from the APC. President Buhari was not forthcoming in mentioning the name of the senior member of the party that resigned, it was apparent that he was referring to the former Vice President who was the latest senior member of the APC to have dumped the party. Atiku last week took the party by surprise as he announced that he was quitting the party for its alleged failure to fulfil its promises to Nigerians. Also, during a photo session with members of the panel shortly after the inauguration, President Buhari threw another banter, this time at the governor of Osun State, Rauf Aregbesola. He jokingly asked the governor why he was not “properly dressed” unlike his Kebbi State counterpart, Atiku Bagudu. Buhari pointed to the Armed Forces Remembrance emblem on the chest of Bagudu which was missing on Aregbesola’s dress. The former vice-president was one of those who contested the party’s presidential ticket ahead of the 2015 general elections and lost to Buhari.